Ayurveda or Ayurvedic medicine is the world's oldest healing system. What's interesting to know that it was developed in India, 5000 years ago. According to Ayurveda, an individual's health depends on a delicate balance among mind, body and spirit. Ayurvedic medicine aims to improve the health of an individual by creating harmony among mind, body and soul. Though Ayurveda usually promotes good health, it is also used to treat a number of health conditions. According to the theory of Ayurveda, the human body is comprised of five basic elements – space, air, fire, water and earth. Each of these elements combine with each other to create three life forces (doshas) namely Vata dosha (space and air), Pitta dosha (fire and water) and Kapha dosha (water and earth). In everyone's body, these doshas are present in a unique mix whereas there's one dosha that dominates the other two. And the well-being of health depends on the balance of these doshas. Being world's most popular Ayurveda destination, India has a large number of Ayurvedic resorts that offer different types of Ayurvedic treatments. Most of the people turn to this holistic system of healing for relaxation and rejuvenation. There are also many Ayurvedic hospitals that provide effective treatment for metabolic, stress related and chronic ailments. If you are looking for a complete course of Ayurvedic treatment, you'll need at least a few weeks. Otherwise, you can simply go for different types of Ayurvedic massages that are proven to reduce stress, boost your self-esteem and rejuvenate your body, mind and soul. At Max Holidays, we offer you well-structured Ayurveda tour packages so that you can maximize the benefits of this Indian natural healing system. Ayurveda is an ancient art of treatments. In India the history of Ayurveda in India is 5000 year old. The very old literatures namely Rig Veda and Athara-Veda have the information available which confirms this. Ayurveda ensures the curing of body, mind and soul. As it originates in India, so it has large number of Ayurvedic centers with highly qualified Doctors who take care of your health based on your medical history. The state of Kerala has numerous small and big Ayurvedic centres. In the earlier ages, Ayurveda was supposed to be the only healthcare system which helped and saved people from many diseases and sickness. After showing great effects on the patients, Ayurveda became popular and then the principles of this therapy were laid out. Started in the ancient time, the Ayurveda treatment in India lost its value later in the medieval era due to many rules and conditions. Due to emergence of the foreign system forced on Ayurveda, it faced a major setback in the medieval times. The teaching of Ayurveda was even stopped and it somehow became very difficult to avail the benefits of Ayurveda treatments in India. The Shamana Therapy is the process to subside the disturbed humour or to return to normal stage while taking care of the balance of other humours. In this therapy the most effective is digestive, appetizers, exposure to sun, Shodhana Therapy exercising and taking fresh air. These therapies are advised when the disease is not chronic and the doshas are not deep. If you want to remove the the causative factors of somatic and psychosomatic disease then Shodhana therapy is very helpful. This is a harsher but more efficient and more effective treatment than Shamana Therapy. This therapy maintains the health for a longer period of time. This treatment is useful for the diseases like Neurological disorders, musculo skeletal, certain vascular states, metabolic and degenerative disorders and respiratory diseases. For the known diseases which are causing factors in the lifestyle and diet of the patient, Nidan Parivarjan is a very helpful treatment. Nidan is one of the most successful Ayurveda treatments. Pathya Vyavastha is Pathya Vyavastha is comprises of indications and contradictions in respect of habits, diets, emotional status and activities of the patient.To ensure the strength of the tissues this treatment emphasis on dos and don’ts of diet etc. Satyavajava Ayurvedic treatment is mainly concern with the problems related to mental disturbance. This treatment helps to cultivate courage, memory and concentration in patients mind. Rasavana Therapy in Ayurveda is useful to enhance the strength and vitality of a person by the way of rejuvenating cells and tissues of his body. Promotion of memory, intelligence, integrity of body matrix, prevention of youth etc are some of the main benefits one can get from Rasayana Therapy. Shodhana Therapy Ayurveda is a Science of Life and is a proven way of living fit and health. Ayurveda treatment therapies in India are supposed to be over 10000 years old but the written evidences are available as far back as 6000 years. The herbal therapies of Ayurveda in India are very famous and well practiced. The role of Ayurveda treatments is to find the root cause of the disease in the human body and cure it in a way that it does not relapse again. Herbal medicines, a balanced diet, yogic exercises and meditation are the main keys in Ayurveda to find against the disease. In Ayurveda the Universal fact is considered that the human body is made of air, water, fire, earth and ether and accordingly the patient is treated with herbs, oil massages, gem stones, naturally soothing environment etc. Ayurveda in India is perhaps has the best shape and best practiced than any other part of the world. 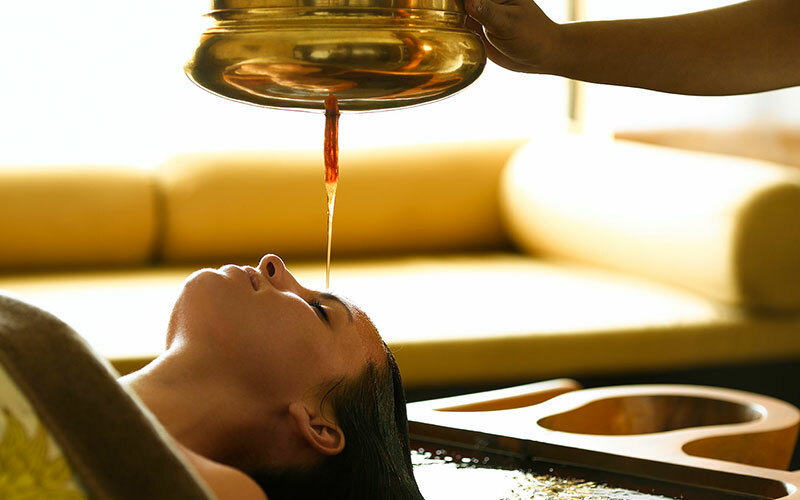 Few of the main Ayurveda treatment therapies in India are listed below which are available in many Ayurveda resorts and spas in India. The word Pizhichil means the dhara given on the body. Pizhichill is a very effective Ayurvedic therapy for body relaxation. This massage is available at most of the Ayurveda resorts and spas in India. Also known as the King of Ayurvedic treatments, Pizhichil massage is combines rich oil with a special heat treatment. This massage treatment is very effective to enhance muscular tone and retune the entire nervous system of human body. This treatment is basically a kind of head massage with warm medicated herbal oils. The Sirovasthi therapy of Ayurveda is also famous in India and it is very useful for very good cure for facial paralysis, insanity, migraine, deafness, those with cranial nerve disorders etc. Dhara is also one of the most famous forms of Ayurveda treatments in India. In this treatment the person lies on the floor or wooden bed and special herbal oil is then gently poured on the forehead of the person. Dhara is a traditional healing method for head diseases and facial paralysis. Navarakizhi is a very effective and popular treatment for hemiplegia and other health problems caused by Vata disorder. This is a 14-21 days course and is considered to be a powerful and effective remedy for those ailing with various skin problems. The patient's body is massaged with little linen pouches filled with Navara rice cooked with prescribed herbs in cow's milk. The therapy is usually of a 14 to 21 day course and is a powerful remedy for those ailing with skin problems. Our nose is the doorway to our brain, mind and Nasyam treatment consciousness and in this treatment medicated oil mixed with herbs is poured through the nostrils. Nasyam therapy in Ayurveda is very popular and useful for the problems related to throat, neck, head, jaw, face, eyes even stress and anxiety. Elakizhi is one of the popular Ayurveda therapies in India used for rejuvenation of human body. Elakizhi is a kind of herbal massage that helps our body in maintaining blood circulation. India is a place where one can find many Ayurveda resorts and Ayurveda hospitals. We are listing below some of the famous Ayurveda resorts of India. For more information and details please write to max Holidays India and get benefitted with the vast information available for the customers.